Oh cheesy, gooey, golden goodness. 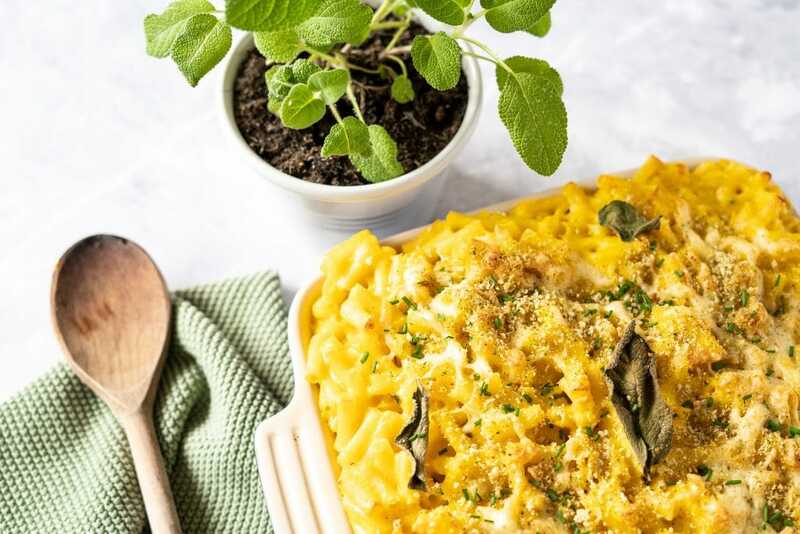 This isn’t just any mac and cheese, its butternut squash mac and cheese. Butternut squash mac and cheese with gruyère and sage to be exact. So delicious I can’t quite put it in to words! A grown-up version of the childhood classic that deserves a spot at a dinner party! 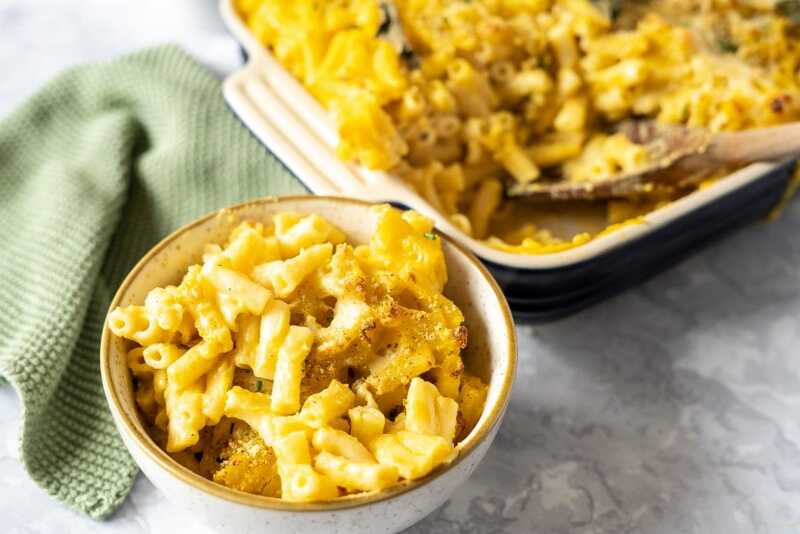 I had been meaning to try butternut squash mac and cheese for a while now, I had read rave reviews about how the addition of butternut squash makes a deliciously silky, cheesy sauce. I can confirm, it does! Plus it adds in some veggies to an otherwise veggie-less dish which is a win win. 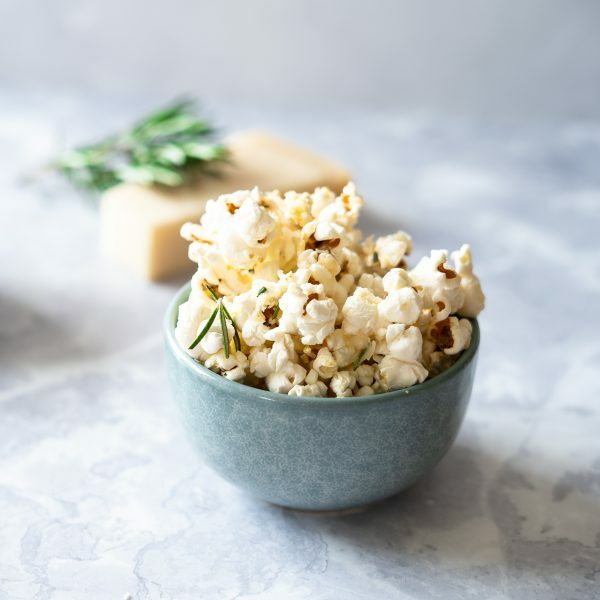 A great option for if you have fussy eaters who don’t like their veggies but love cheese and pasta (not just kids – boyfriends, girlfriends, parents, I’m not discriminating haha!). 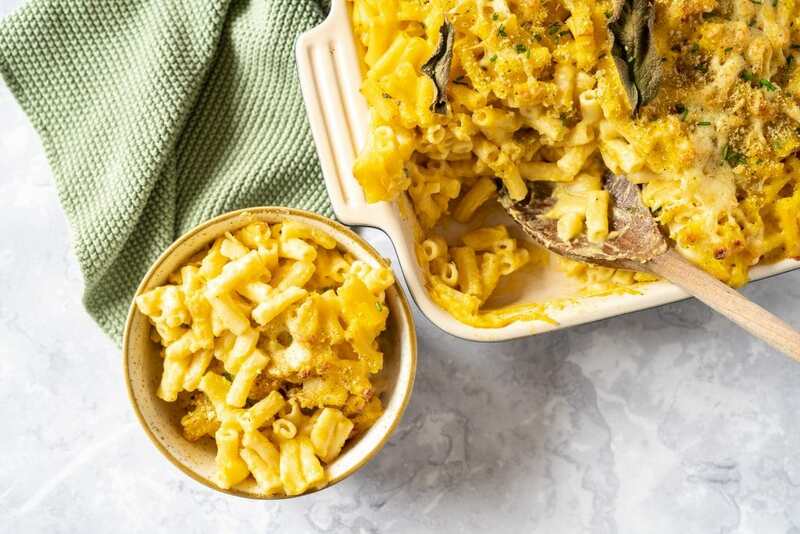 This butternut squash mac and cheese can also be made vegan with a few easy substitutions and tastes just as good. Simply use vegan cheese and a plant milk and you are good to go! I recommend soy or oat for this recipe. I would be lying if I said that adding butternut squash to this suddenly made it a healthy dish. It certainly has less cheese and more vegetables than normal mac and cheese but it is still indulgent! Saying that, all the dairy in this dish makes it a great source of calcium. The butternut squash also adds loads of vitamin A and vitamin C. Opt for brown macaroni for a fibre boost! Here is the recipe! You are going to need a food processor or blender for this, as well as a casserole dish. 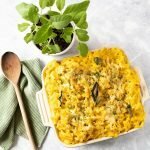 The best mac and cheese you will ever eat, with hidden butternut squash! Preheat the oven to 180c/350f. Peel, core and dice the squash if needed. Bring a pot of water to boil and cook the butternut squash cubes for 10-15 minutes until tender. Meanwhile, cook the macaroni according to the instructions. Once cooked, drain and set aside. Once the butternut squash is tender, drain and add to a food processor or blender with half of the milk and blend until smooth. Set aside. Heat the oil or butter in a saucepan and sauté the sage leaves for 2 minutes then whisk in the flour. Gradually add in the milk, a splash at a time, whisking until smooth in between additions. Once you have added all of the milk, do the same with the butternut squash mixture. Bring the sauce to a boil, then reduce and simmer for a few minutes until thickened. Add the mustard, garlic powder, nutmeg, salt, pepper and grated cheese to the sauce and heat until the cheese is melted. This is your sauce. Mix the sauce and the pasta together, then spread out in a casserole dish. Top with the breadcrumbs, some black pepper, the sage leaves and some extra cheese and grill for 10-15 minutes until the top is golden brown. 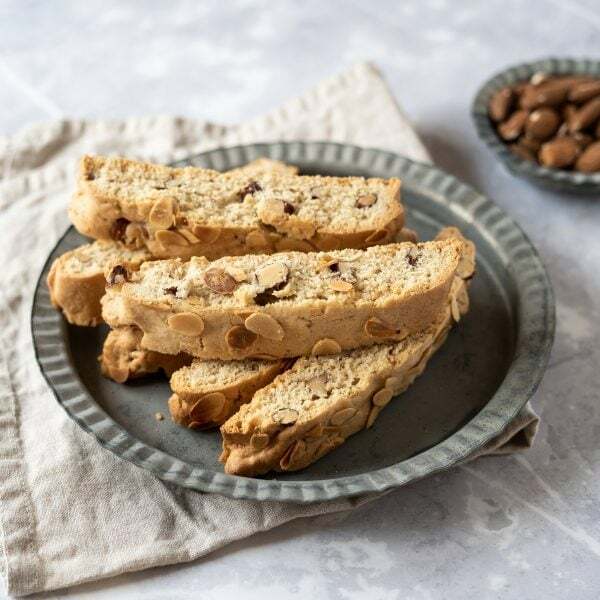 I hope that you enjoy this recipe as much as I did! Let me know down in the comments what you think!